Complete with a full width internal top shelf to allow storage of equipment, materials and personal items. This caretakers locker also has a vertical centre partition which creates two distinct storage areas. With a double coat hook the locker provides hanging space for uniforms and other clothing whilst the addition of three shelves in the secondary section provides 4 additional storage compartments. 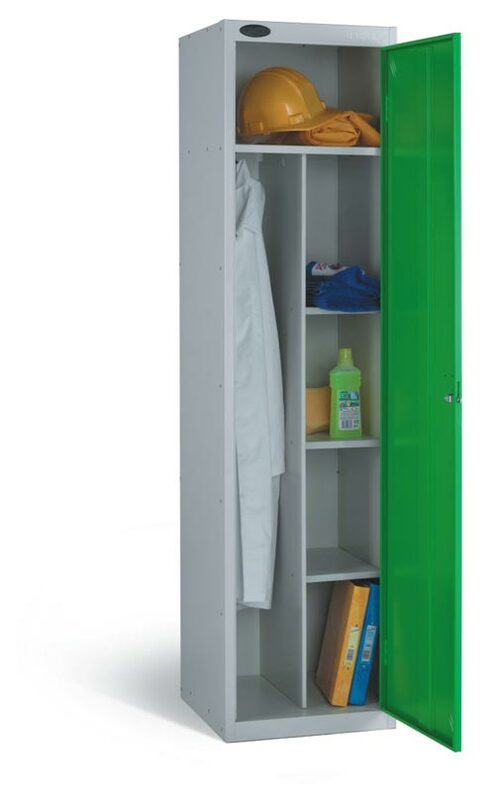 This locker is ideal for the storage of uniforms and workwear, materials and equipment. Available in a range of colours and with a range of lock options it is also available to but in nests of 2 units saving even more money.